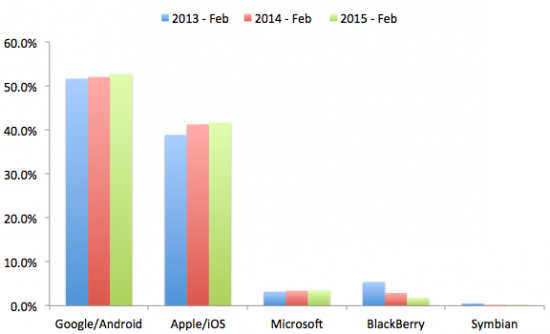 Will Microsoft Drop Windows Mobile? Microsoft has reigned supreme in desktop user experience by bringing Windows to enterprises, educational institutions, and homes. Microsoft’s mobile market is not making the same impact, to say the least, and rumors have circulated since Microsoft’s announcement of a fully operational ROM for Android to be utilized by developers, along with their unveiling of their new web development API Stack and the ability for mobile app developers to easily deploy their iOS and Android applications to the Windows OS, that they’ll be giving up on the Windows Mobile and the smartphone market. In reality, the marginal cost incurred by Microsoft to open interoperability by spanning the Windows 10 kernel across the desktop, smartphone, tablet, and Xbox, is not significant in light of Satya Nadella‘s vision for Windows 10 serving as a common software foundation allow seamless, uninterrupted activities across devices. Although the adoption of Windows Mobile OS is growing, Microsoft’s market share in the US is still shrinking compared to the adoption rates of both Android and iOS. While Microsoft has acquired Nokia, the Android ROM deal they made with Xiaomi would only put them on two smartphones-unlike the array of smartphones that Android runs on. Their move to buy the Nokia hardware company and begin to refine Nokia’s business processes, cutting down on hardware production quantity and concentrating on quality shows that they mean business when they aim to integrate cloud-based services, adaptive UX controls, gesture tracking, voice commands, and more. Windows 10 OS will be released in a few weeks to over 100 countries, with Windows 10 Mobile to follow next quarter, and its accessibility ventures enable Windows 10 users to easily move between their Xbox console data, to their Windows 10 PC, to smartphones and parent desktops-they will be able to share information more easily than ever. Hardware ventures like their successful Surface tablet and their hardware projects, Microsoft Band and HoloLens, that take advantage of RFIDs and sensors to bring the cloud to its users, seem to drive mobile productivity for Microsoft in a direction that it may put it into a position to lead the market into a new tech future-instead of trying to gain market shares among smartphone users. As a Microsoft Partner, we at Ayoka provide custom software development with web and mobile application services, along with database development and integration services with .NET and other open-source APIs.